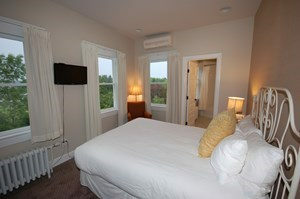 Room 205 is located on the second floor of the Mansion. 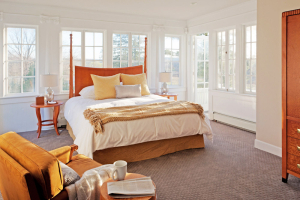 This cozy room is furnished with a Queen-sized bed, flat-panel TV and in-room refrigerator. The on-suite bath features an oval soaking tub with rain shower. 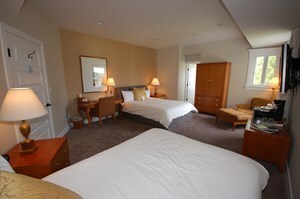 Room 206 is located on the second floor of the Mansion. 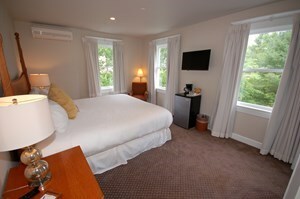 This room is furnished with a King-sized bed, reading chair, flat-screen TV and in-room refrigerator. The on-suite bath includes a whirlpool tub with rain shower. Room 308 is located on the third floor of the Mansion. 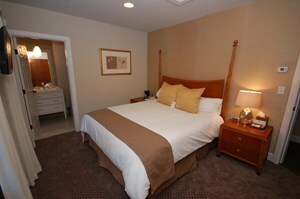 This cozy room is furnished with a King-sized bed, armoire, flat-panel TV and in-room refrigerator. The on-suite bath features an oval soaking tub with rain shower.